BBC Radio Wales is BBC Cymru Wales's national English language radio station. 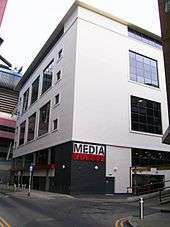 The station began broadcasting on 13 November 1978, following the demise of the 'Radio 4 Wales' service (previously the Welsh Home Service) and BBC Radio 4's transformation into a national network, moving from medium wave to long wave. The current editor of the station is Steve Austins. In November 1978, BBC Radio Scotland and BBC Radio Wales were created as distinct stations on the former Radio 4 Scottish and Welsh medium wave opt-out frequencies of 810 and 882 kHz. They were part-time initially, broadcasting for only 20 hours per week, and relaying Radio 4 at other times; however the groundwork had been laid for the stations to become important, respected full-time services. Radio Wales now broadcasts for 19 1⁄2 hours each weekday and 20 hours on Saturday and Sunday with a simulcast of the BBC World Service after closedown every night. BBC Radio Wales was preceded in the autumn of 1978 by four experimental local radio stations broadcasting for a week: Radio Wrexham, Radio Deeside, Radio Merthyr and Radio Rhondda. They were broadcast for just one week using an RTÉ Outside Broadcast transmitter. The first editor of BBC Radio Wales was Teleri Bevan, a former BBC Radio 4 Wales producer. Anita Morgan presented a breakfast show called AM, but this soon gave way to a more modern show for the period, presented by Chris Stuart. The other main presenters for the first decade were Mike Flynn, Vincent Kane, Noreen Bray and Alun Williams. By 1985, Roy Noble was also a regular daily voice, presenting weekday magazine shows for the station for 27 years. Old Radio 4 type continuity studios were modified to become 'self operated' by the early 1980s. Outside broadcasts from different towns in Wales were also introduced, with Mike Flynn and Alun Williams hosting a weekly three-hour Friday morning live programme. BBC Radio Wales also started to embrace publicity similar to that used by UK commercial radio. Other early presenters included Wyn Calvin, Maureen Staffer, Sylvia Horn, G.V.Wynne Jones (Geevers), Claire Vincent, Piet Brinton, Jackie Emlyn and Princess Anne's biographer Brian Hoey. Following BBC Wales' experiments with community radio in 1978, two permanent opt-out services were developed in the North East and the South East. Radio Deeside was reopened in February 1980 in response to the closure of the Shotton steelworks. Its coverage area was expanded to the rest of Clwyd in October 1981 and the station was subsequently renamed BBC Radio Clwyd, broadcasting extended local news bulletins, a mid-morning show and occasional special programming from studios in Mold until its closure in October 1993. After the closure of Radio Clwyd, local bulletins for north-east Wales continued until 2002, staff having moved from Mold to Wrexham in summer 1998. Current programmes include the flagship breakfast and drive-time news programmes Good Morning Wales and Good Evening Wales, the current affairs phone-in Morning Call, weekday magazine shows with Jason Mohammad and Eleri Siôn, Wynne Evans' Friday afternoon show, and Chris Needs in his Friendly Garden, which airs each week night from 9 pm. Weekend presenters on the station include Roy Noble, Wales Today anchor Jamie Owen, Adam Walton's Saturday night new music show, Celtic Heartbeat with Frank Hennessy, and comedians Rhod Gilbert and Owen Money. Radio Wales Sport is broadcast on Saturdays between 2 pm and 6.30 pm during the football and rugby season (the programme is extended on occasions to include live commentary of early and late matches). The programme also airs on weekday evenings from 7 pm to 9 pm (extending to 10 pm on nights with live commentary). ↑ "Steve Austins announced as new Editor BBC Radio Wales" (Press release). BBC. 11 May 2010. Retrieved 12 September 2016. ↑ "Broadcasting (Wales)". Parliamentary Debates (Hansard). United Kingdom: House of Commons. 21 January 2003. col. 274–280. 1 2 Keating, Matt (12 June 2001). "BBC voice 'not Welsh enough'". The Guardian. London. Retrieved 4 August 2013. ↑ "BBC Wales loses 'race' case". BBC News. 1 August 2001. Retrieved 4 August 2013.